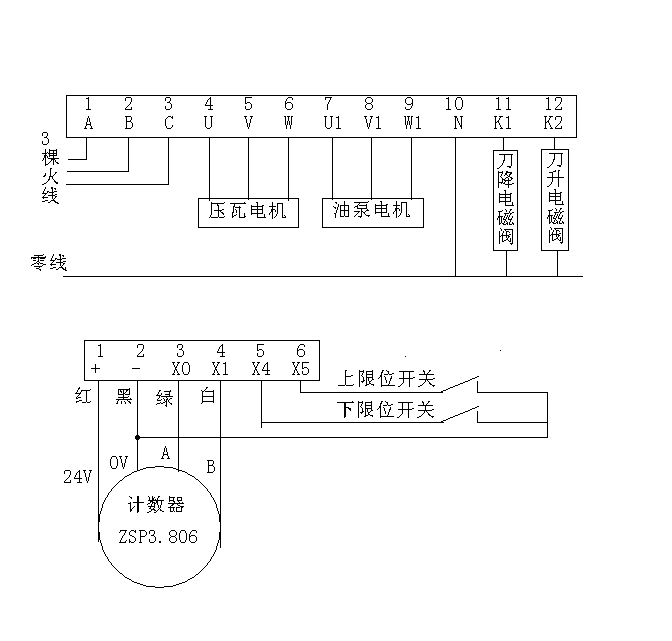 Machine electrical source is three live wire and one zero line.Three live wires are respectively connected with row A,B,C ,and zero line with N besides electromagnetism clique public zero line , U,V,W connected with electrical engine of roll forming machine ,U1,V1,W1 with oil pump electrical engine,droping reamer electromagnetism clique control line with K1(11),and ascending reamer electromagnetism clique control line with K2(12). SET is amending and selecting key ;ENT is affirming key ;ESC is the key to clear work longth ;ALM is the key to clear woor sheet numbers; ∧,∨ is menu transition key ;CLR is the key to clear altered numbers.0—9 is keeping choosing key. Press oil pump start-up button. 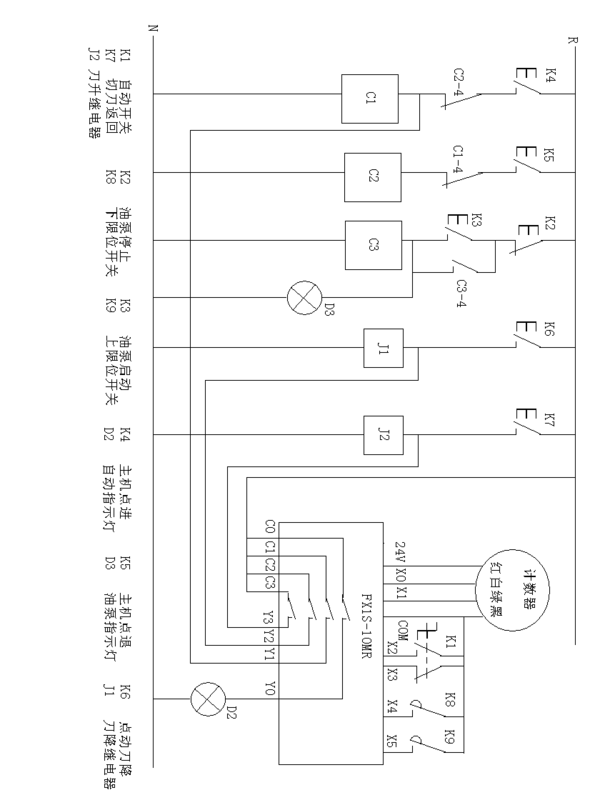 Notice turnaround of oil pump electrical engine . Press tile machine and go ahead ,make the plate go to the outer of knife-edge,press scissors and decline to cut off board,press scissors and ascend the reamer to upper limit location. When showing work menu predicament ,press the key of ALM to clear current sheet numbers;press ESC key to clear current length. When showing work menu predicament ,press SET key and choose length or sheet numbers. (press once SET key,and count of sheet number is circled by black frame.Press again, length numerical value is circled;Press SET key at a time,sheet number and length is circled by turns, numerical value is changed when it is circled to turn into black ).Press CLR to clear. After seting up,wrest recloser(wrest in agreeable hour hand ),the machine work according to enacting data,and stop automatically after the work is completed.If it need continue to work with same length,press ALM key(the key to clear woor sheet numbers),the machine will work again according to enacting data of show screen.If it need to chang length , wrest the automatic recloser back.And then enact next production task.And notice before starting up auto next time to clear already cutted sheet numbers(press ALM key in show screen). Wrest automatic recloser if it need to stop machine in midway(negative hour hand);if it continue to work ,you open automatic recloser. Decelerating distance is used by frequency conversion engine and commonly is 200mm,and general engine is inanition for the numerical value. Sheet number or length is not enacted. Manus and self-motion can’t work ,and show screen can’t display. Manus and self-motion can’t work ,and pressure table display less than 200V,and shouw screen have show. Zero line is turnoff. Examine zero line of outer of computer. If only wrest automatic cutting reamer and go upwards at all times. Upper limit location switch is turnoff and damaged . Electromaganetism val Electromaganetism valve ve is locked . 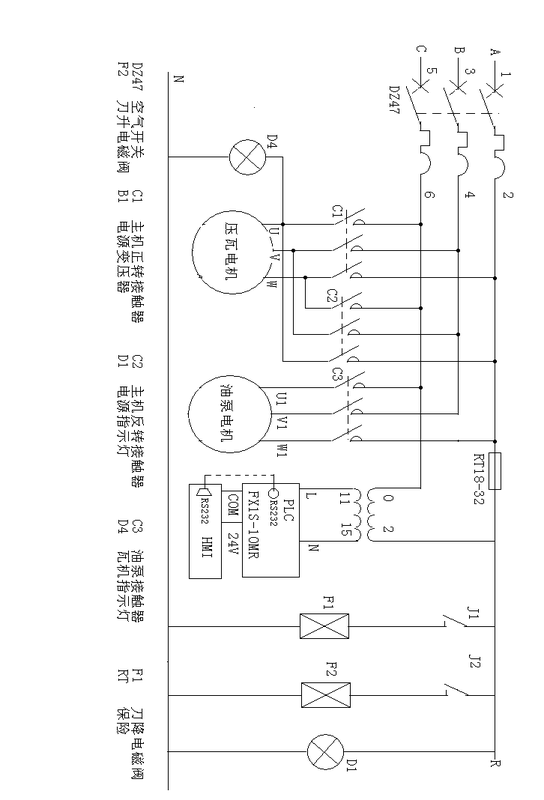 Handling method: turn off oil pump,use screwdriver to disclose manus replacement pin of electromaganetism valve in come-and-go .First disclose from the low end, then disclose from two ends in come-and go,until you disclose and feel elasticity by hand . If only open oil pump,cutting reamer goes upward at all times. Electromaganetism valve is locked.Handling method: close oil pump , Electromaganetism valve,until you feel elasticity. If electromaganetism valve is often locked ,you need chang oil and clean out Electromaganetism valve . 1 Give your attention to safety when the facility is busywork with electrification.The facility is connected with safe ground line. 2 At any time don’t put your hands or eyewinker to knife-edge. 3 electric facility is prevented from rain and sun shine;counter is avoid to strike by forcible matters;line is prevented from bump and break by plate. 4 machine cooperation movement part often add lube.